Prototype: When the Housatonic line was being built northward from Bridgeport in the 1850's, the town of Danbury refused to buy a stock subscription in the company. Out of spite, the railroad went right past Danbury and continued northward, leaving Danbury industries with no convenient transportation system. Freight had to be hauled to Hawleyville by horse cart or wagon to be loaded there onto the railroad. 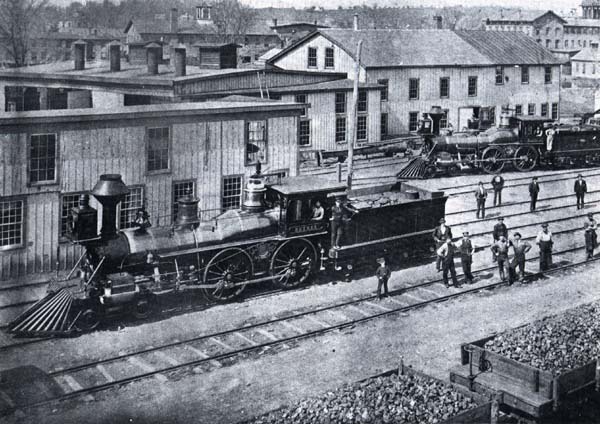 Incensed, the town of Danbury got together with the town of Norwalk, and built their own railroad known as the Danbury & Norwalk in the late 1860's. It was a short line compared to the HRR, but quite profitable and well-run. In time, the Housatonic served Danbury from the White St. Station via it's sister NY&NE Ry., but neither the HRR or the D&N had a physical connection to one another until the takeover in 1887. When the takeover occurred, a loop track connecting the D&N Main St. terminal to the HRR/NY&NE tracks a few hundred feet away was installed. 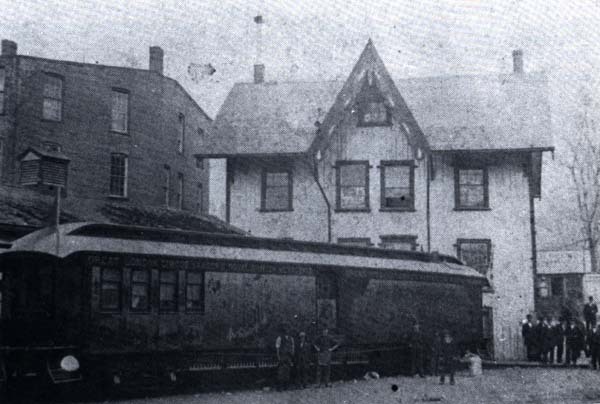 Passenger trains served both stations in Danbury until after the New Haven takeover in 1892 and later. Danbury was a major manufacturing center for hats and undergarments as well as other products. On the Model: When we started Building Wilson Point, which in the original plan was slung under Danbury, we realized that covering up the scene was going to be a really bad idea. Danbury's biggest draw will be the passenger terminal at Main St., and the yard and industries located in the loop. The passenger terminal features the original D&N Station at the end of the platforms and the roundhouse and coal bunker. A four-track yard will be used to classify freight cars without benefit of a yard lead (none existed on the prototype). The layout of this entire area was governed by a lucky break -- a pristine Sanborn Fire Insurance map from 1904 found in the Danbury public Library. The loop is modeled behind the D&N roundhouse, as it was in real life. The back side is compressed into a 20" r. curve, most of which is built onto a flip-up section. When not in use, this flip up will allow better access to the Wilson Point area below. When down, a fabric backdrop attached to the edge will keep the Danbury scene separated from the Wilson Point scene below and on the other side. A coal dealer and other scenery will disguise the seam where the section flips up. The NY&NE station at White St. in Danbury is also modeled, along with the crossing that can be seen in the map above. From here, the NY&NE tracks went Northeast towards Boston, and the HRR tracks went north to Brookfield Jct, Northwestern Connecticut and Massachusetts. The NY&NE here is designed to be an active interchange, with cars coming from hidden staging onto the NY&NE line, crossing over to the HRR tracks and back around the loop to the freight yard. The Danbury Yard engine terminal at Main Street. This photo was taken in the 1870's, showing most of the board-and-batten structures that populated the scene. I don't know the purpose of the building in the foreground to the left, but though the roundhouse is clearly visible behind it. The building behind the roundhouse was a locomotive shop for heavier repairs. Some of the buildings of Danbury are visible in the distance -- This should provide good examples for backdrop painting. The roundhouse was replaced in 1879 by a new structure, I think of brick construction, but I have not been able to locate any pictures of it. I'm considering modeling the scene just as you see it because I like it so much. 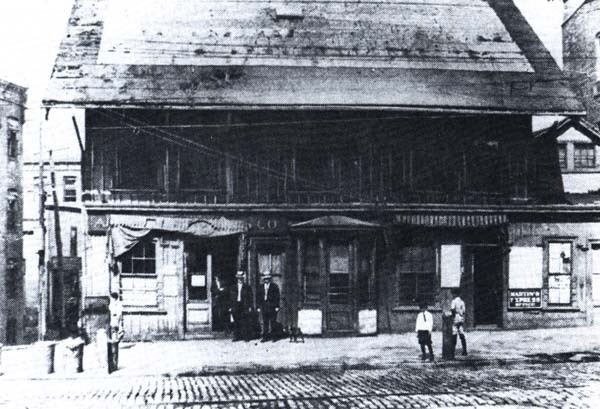 Main St. Station Was the original Danbury & Norwalk station in Danbury. Situated on the model at the end of the Danbury peninsula, this is also a board-and-batten structure like the other railroad buildings here. A close look at the front of the building reveals there was an Adams' Express Company office here, Adams was the biggest express company in the east at the time. I believe it later became part of Railway Express Agency, or REA. Notice the style and construction is very similar to the station at Bethel, no doubt they were built at the same time. The large lighter-covered area on the roof in front of the station looks to me like there may have been an advertisement painted on the roof. A covered platform extended from the right side of the station allowing passengers and baggage to board and de-train out of the weather. The roof of the platform can be seen over the circus car in the back picture. The small dormer on the far right of the front picture appears to be connected to this platform. Perhaps this was a baggage area?